Connect the Dots Ginger | Becky Allen: How Different Can Pregnancies Be? The story of my 3 different pregnancies. All pictures are at 20 weeks! I lost a ton of weight before I got pregnant with Mason. But once we got that + sign I stopped all exercise and just started eating whatever I wanted. I didn't care. I was finally pregnant after 8 years. I earned it. And I "assumed" I would lose the weight while breastfeeding. (we all know what assuming means and oh yeah, I was an a** because I did not lose 1 pound from breastfeeding!) Oh, and I gained 55 pounds making me 255 pounds day of birth! I had again lost a lot of weight through eating right following a nutritionist given plan. 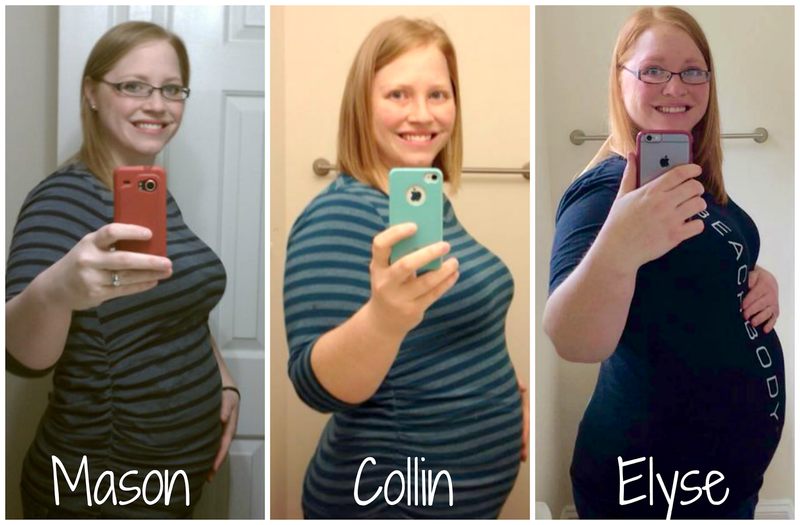 I had gotten into running that summer and even ran a half marathon at 29 weeks pregnant. AMAZING RIGHT! But again once I got pregnant, all I learned before went out the door and I let my comfort eating take over. And once that half marathon was over, I stopped all running and most exercise. I was tired. I was sore. I was done! And I gained a total of 20 pounds putting me to again, 254 pounds day of birth. First time in all pregnancies that I was the heaviest starting weight. 200 with Mason, 234 with Collin and 237 with this one. But...I was determined to continue exercising (which I have) and eat right (again doing!) And have gained the LEAST amount of weight while being pregnant at this point in all 6 of my previous pregnancies (including my 3 miscarriages!) Only up 7 pounds as of today. I have more energy. I feel better. My belly is carrying differently. I am doing more strength training with cardio this time around. Really mixing it up. And only doing 30 minutes 5 days a week. AND IT SHOWS! I think I look better than I did when I was a cardio queen with Collin. (even though I am actually about 10 pounds heavier, NOW, on the scale than I was with Collin at this point) All because I am taking care of me from the inside out. Feeding my body what it needs and wants, and still allowing myself some treats WITHOUT guilt. Hoping to be at 255 at time of birth, but only time and baby will tell! The point is, don't stop exercising. Don't just do one thing to stay healthy. To truly be healthy it takes a mindset change, a lifestyle change. A desire to change. And doing the whole package to stay healthy, pregnant or not. Doing just exercise doesn't work. Eating right only doesn't work. You have to do both exercise, and eating right along with working on you mentally for the changes to truly last and work. This is what it truly means to have made a lifestyle change. That I continue WANTING to do the things that make me feel better, look better, be better during any changes that occur in my life. This is what it is like to LOVE myself and to finally ACCEPT myself and it feels amazing! Have you gone through life changes that just rocked you off your goals or health and fitness plans? What did you do? What are you willing to do to get back on them? Comment below!